Donate $10 to Passports With Purpose 2014, Win A Vacation? You are here: Home / Blog / Donate $10 to Passports With Purpose 2014, Win A Vacation? It’s that time of year again when I like to bring your attention to a cause that provides double benefits to you the reader and me, the writer. You have a chance to donate to a global charity as well as the opportunity to win a travel-related prize. Interested? Here’s some backstory: PWP was started in 2008 by four travel bloggers dedicated and motivated to rally the travel blogging community to give back to the places, we, as travelers visit. That first year the community raised $7400 for Heifer International, an organization focused on ending hunger and poverty. In the past five years, PWP has raised money to provide assistance to Cambodia, build a village in India, two libraries in Zambia, and construct five wells in Haiti. Over the past seven years, we’ve raised over $400,000. That’s some decent fundraising. For 2014, PwP didn’t set a monetary goal as in previous years. The goal is to raise money for Sustainable Harvest International, an organization that teaches sustainable farming techniques through intensive technical assistance to impoverished rural communities in Central America. These techniques will allow them to recuperate degraded lands, making them productive in the long term. For each $5000 we raise during the fundraiser, SHI will help an extended family in Honduras learn to farm sustainably and feed their family. Training will last for five years with lasting benefits for the entire community. 100 percent of donations, exclusive of PayPal fees, will go to SHI. I believe in and wholeheartedly support efforts that aid in the economic development, empowerment, and advancement of disadvantaged people, particularly individuals in Africa or the Caribbean. It’s been in my heart since college and remains in my heart to this day. Whatever part I can play in the equation, big or small, I play it. How Can You Donate and Possibly win a prize? FIrst off, here are 5 reasons why you should donate to PwP. Here’s how you donate: You can donate in $10 increments. Each $10 donation counts as an entry in the catalogue of prizes available on PwP’s site this year. You can bid on the prizes by donating HERE and check them out in the PwP catalogue HERE. The fundraiser will take place from 11:59 p.m. EST on Monday, December 1 until 11:59 p.m. EST on Wednesday, December 17, 2014. I’m hosting a pretty sweet prize on the blog this year. Last year it was a stay in Niagara Falls, NY. 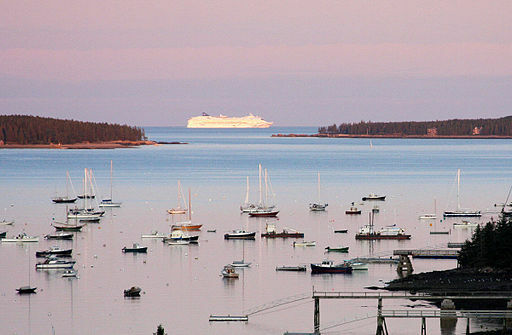 This year it’s a seven-night vacation in Bar Harbor, Maine valued at $1200!! I have never been to Maine but boy is it on my list. When I think of Maine, I think of relaxing on a quiet beach with a cool breeze and few bodies around. I think of pizza and eating lobster day in and day out. Have you ever been to Maine? Would you like to possibly win a chance to go there? Then definitely put in a bid for it and keep those fingers crossed. This package features 7 nights of serene sleep at a rustic cottage nestled among tall fragrant evergreens on a secluded cove. By daylight, take a trip out into the dazzling waters of the Atlantic Ocean on a whale watching/puffin tour, then bike around the many miles of quiet carriage roads with bike rentals from Acadia Bike and accessories from Cadillac Mountain Sports. Tired after biking and hiking? That’s what the spa is for! The trolley will then take you around the island on a relaxing and historic tour. After eating mouth-watering delicious pizza, catching a movie, and nibbling on some decadent chocolate before going back to sleep in your peaceful cabin, you may never want to leave Bar Harbor! A $1200 vacation? That’s pretty sweet! Special thank you to Bar Harbor, Maine for donating such a wonderful prize. And thanks to TBEX and HomeAway for also coming on as sponsors. Most of all, thank you for thinking of others and donating a little something to others in need. Hoping that you walk away a winner as well! I hope you win Keryn. Would love to be able to bid on it myself. I’ve never been to Maine. what a great organization! I already donated last month and hope to participate next year. I have never been to Maine and this prize sounds wonderful! I was in Marthas’s Vineyard last year and the weather and scenery in New England is just beautiful! Yes I love New England as well! My hubby has been to every state but 3 and Maine is one of them. If I win this, it’ll be the best early birthday present ever. What an awesome prize for such a terrific and meaningful cause!